Chinese porcelain made in the Xuande period is the most highly esteemed by connoisseurs for the technical perfection attained in this period was rarely surpassed. 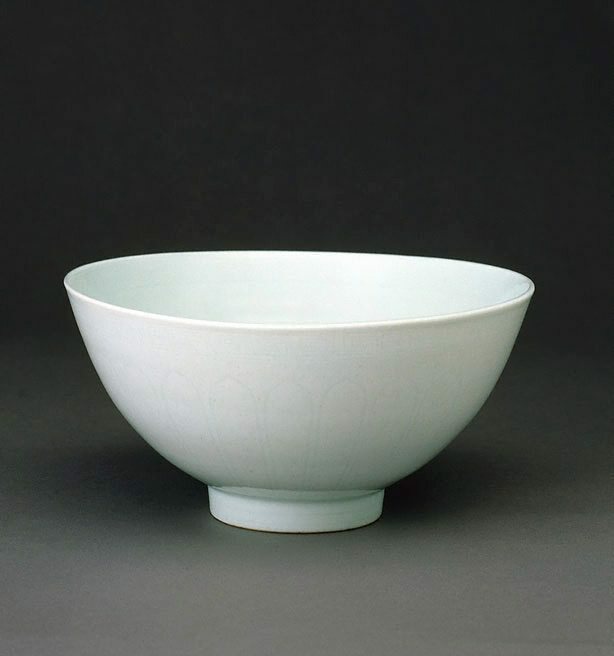 This piece is a classic Ming ceramic, its shape characteristic of the first quarter of the 15th century. This 'lianzu' or 'lotus-seed capsule' bowl often occurs decorated in underglaze blue, while the subtler, more appealing incised decoration of this bowl is far more uncommon. The shape imitates the seed pod of a lotus with the exterior of the bowl decorated with elongated 'lotus panels' and a regular key fret around the rim. The cavetto is decorated with a peony scroll in the scarcely perceptible 'secret decoration' ('anhua') so skilfully practised by Chinese potters. Asian Art Department, AGNSW, June 1988.